Info & Booking: mr.bizz@tiscali.it Mr. Bizz comprises a perfect duo of two brothers Fabrizio and Matteo Floris,who's several early collaborations with different pseudonyms, including Minimal Cadets, permitted collaborations with the most important labels such as Frisbee Tracks,Multicolor Recordings etc. Mr. Bizz, although young,had much early success with releases such as "Eternity"(summer 2009) on the German label "Cocoon Recordings",which was played to death all summer and featured in the compilation mixed by Dubfire and Loco dice entitled "Ten years of Cocoon ibiza". 2010 was a full working year, Mr. Bizz began to release with some classic labels: Tuning Spork, Resopal Schallware,etc and remixed the legendary Hakan Lidbo.In 2011 they became connected with Sian's own "Octopus Recordings" and the Greek label "Material Series" ran by Mihalis Safras,thus began the project in earnest. In this year they were also remixed Dj Chus, Mauro Picotto, Mihalis Safras and Pig & Dan. At the beginning of the 2012 they started to hit top positions on charts and light up the radar of most big name DJ's. Garnering several hit Ep's on Octopus,with "Exit" and "Broken", and with “Bamboo” for 5 weeks in first position in Techno and appears on “Top Techno Tracks Of 2012 ” for Beatport. Their remixed on 2012 best artists as: Stefano Noferini, Lutzenkirchen, Spektre,Yello, Mauro Picotto, Zoo Brazil, Hermanez and more.. In 2013 the guys debut on Dubfire’s label “Sci+Tec” and on Monika Kruse’s label “Terminal M” and making some collaborations with Harvey McKay and the belgian duo Filterheadz. The brothers have released several tracks on Octopus Recordings, Sleaze Records,Deeperfect,Toolroom,Bitten Records, Suara, MB Elektronics, Blufin, Material, Respekt and many more.. They have played in several prestigious clubs such Sankeys Ibiza, City Hall and Mac Arena Mar (Sonar Off) in Barcelona, Monza Club in Frankfurt, Piso 30 and Wild Club in Colombia, WesterUnie and ADE 2014 in Amsterdam, Faktory Club In Lisbon and many other clubs around the world. 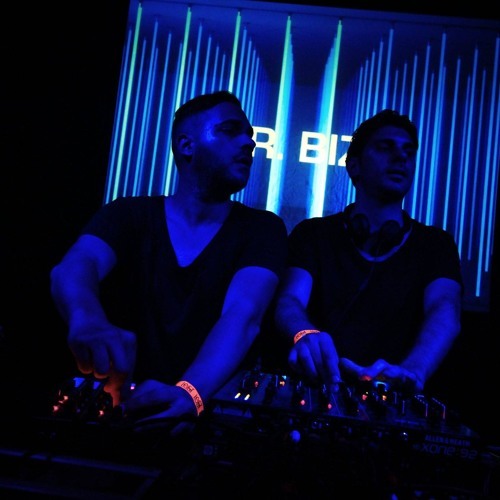 The heavy beat patterns and the dark vocal snaps typical of Mr. Bizz ,have defined their unique original style and won them praise unilaterally in the dance community.